The aim of this site is to provide the visitor to the Northern Highlands, and those touring on the NC500 route, with basic information to access some of the superb fishing on offer in this region. To accomplish this we have divided the mainland region into 7 fishing areas. 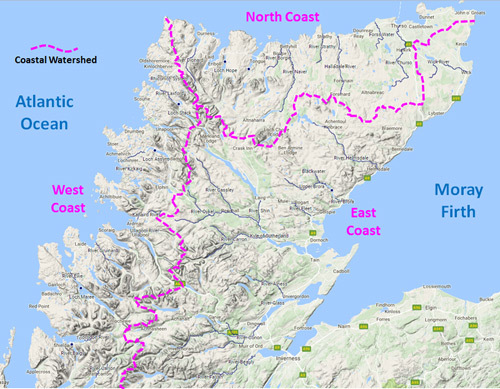 To describe both river and loch fishing by area, this is best done with reference to the river catchments. These can be divided into 3 groups based on the coast that each river drains into. 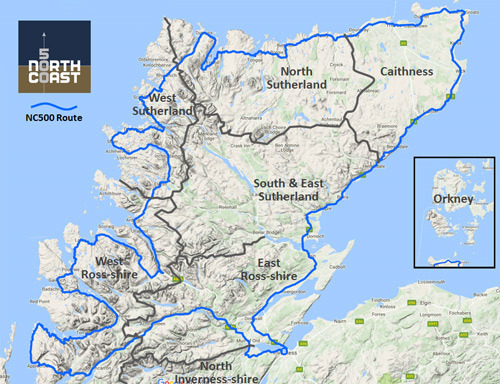 As can be seen in the map below the east-west divide is close to the West Coast, sometimes just a few miles inland. The second level of spatial classification is based on the approximate boundaries of the old counties. Although they have little significance to local government these days, they are still known as geographical areas. 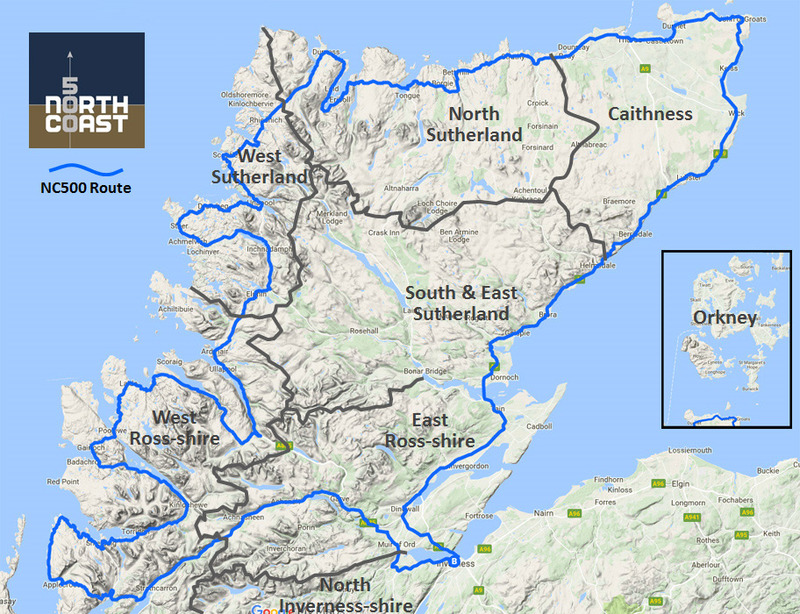 Hence the West Coast is divided into West Ross-shire and West Sutherland and the East Coast into East Ross-shire, South and East Sutherland, and in consideration of the NC500 route, a small part of Inverness-shire lying to the north of Loch Ness. There are 2 variations from this methodology to arrive at the final areas. 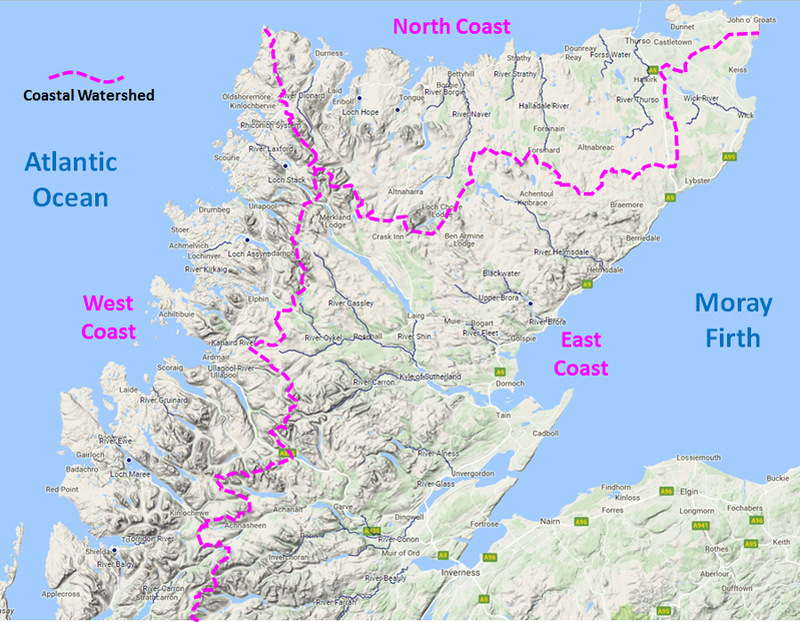 The boundary of the North Sutherland area extends south to include the lochs of Badalnloch and Achentoul estates, and to the East to include some of the Aultnabreac lochs as access is from Forsinard. As Caithness is distinct from a topography viewpoint and only has 2 salmon rivers, one draining to the north the other to the south, it is considered as a single area. Finally, we have also included Orkney as it is an important trout fishing destination and just a short crossing from the mainland. In the future we may expand this site further to include Skye and the Western Isles.